In LF2 round 22 COB Calais and Cavigal Nice punched their tickets for the LF2 Final Four while the CFBB recorded their first victory of the season. At last Grégory Halin, the head coach from the CFBB, had something to smile about with his young team coming up with a big win on the road against Dunkerque Malo (85-61). The CFBB scored the first 8 points of the game and never looked back. Leading by 14 points by the end of the first quarter, they maintained a double-digit lead the rest of way. As the common statement goes in basketball, stats don't lie. The CFBB shot the ball better, had more rebounds and assists than their opponents. They also had less turnovers. 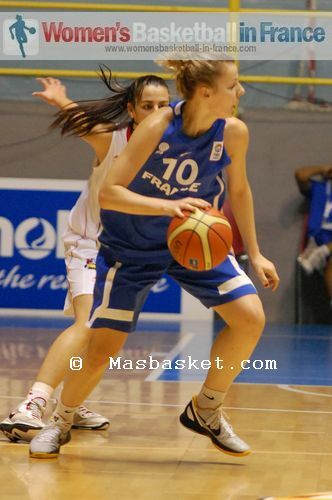 Fleur Devilliers (in picture) and Laëtitia Guapo were the leading players for the CFBB with 21 and 20 points each. Devilliers who had a good all-round game also dished out 4 assists. For Dunkerque Aurélie Durand had a solid game with 21 points. But as so often this season at home the ball just refused to drop. This win does not change much for the CFBB who are at the bottom of the LF2 regular season standings. They would need to win their remaining four games and hope that either Dunkerque or Limoges do not win again this season to move ahead of them. COB Calais are on their way to a second L2F Final Four after securing a top 4 place with their victory against Limoges (82-49). COB Calais once again did not give their opponents a chance to settle into the match and ended the contest by half time leading (45-23). With the exception of their captain Aurélie Cibert (5 assists), all the players from Calais scored. 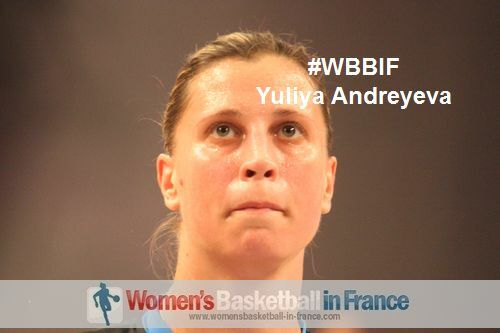 Mélanie Arnaud (in picture) was in a class of her own and finished the game with an impressive stat line, 25 points, 12 rebounds, 5 steals, 1 block and 6 drawn fouls. She was the player of the match. Floriance Herrscher (13 points) found herself in the unusual position as passer with 7 assists. For Limoges Iva Grbas was the leading scorer with 11 points. Cavigal Nice bounced back from last week's defeat against COB Calais with a big victory against Pau Lacq Orthez (82-52). Pau dominated the first four minutes of the game and led (17-10). However Cavigal Nice managed to find their way back quickly and went into the lead briefly with a three-ball by Margaux Okou-Zouzouo (11 points) before Emilienne Vidal tied the game with a split pair at the end of the first quarter (18-18). From the second quarter Cavigal Nice put on a demonstration in the art of team basketball with everybody scoring and dishing out at least one assist in the (82-52) victory. 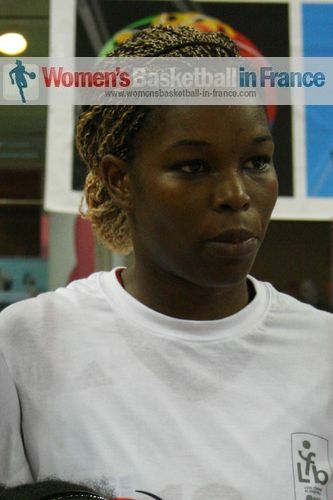 Fabienne Costant (in picture) with her 14 points from 7-of-10 shooting from the floor was again the most consistent player from Cavigal Nice. With this win the first objective of Cavigal Nice has been achieved that is their qualification for the Final Four. Angers led 11-0 with just over three minutes played against Reims and the game was already over. Reims tried to get into the match by stepping up defensively but Angers are also a good defensive team. So Reims were unable to cut into the deficit and hence they trailed by half time (20-38). Angers strolled through the second quarter with nobody playing more than 26 minutes. All 10 players scored at least 4 points as they rolled onto an important road victory (82-45). 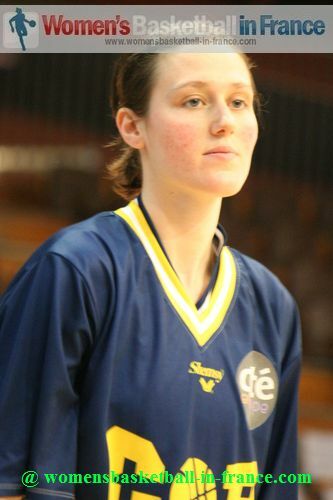 Julie Barennes was the leading scorer with 16 points. Angers remain in third place, while Leon Trégor who did not play this weekend are in fourth. Roche Vendée continue their late challenge for a top 4 finish with a hard fought home victory against Illkirch-Graffenstaden (74-64). Roche Vendée did the damage in the first half in which they hit 58% of their shots to lead (51-29). 17 March 2013: Will Nice be dethroned by COB Calais in their title chase?